"Providing a Recreation Ground for Arborfield"
As long ago as 1938 the purchase of a recreation ground – a site behind "Pond Cottages", 120 yards x 200 yards, was considered, which could be financed by the selling of 2½% Consols worth £150. However, the land was in the Liberty of Newland and consultations were made with the Newland Parish Council. This Council felt that the project was financially extravagant which could not be supported due partly to being unable to afford a full-time groundsman! So the matter was left for more settled times. 21 years later in 1959, the amalgamated Councils decided it was time to have another go, when the project occupied an abnormal amount of time and no less than nine sites were examined. The final choice of site was the same as 1939. However, the owners objected, and to a second site off the Swallowfield Road. The Council was not prepared to proceed further and Mr. H. Lee allowed villagers to use a field for soccer and cricket. In 1961, a village meeting approved the expenditure of £200 to the new Arborfield Playing Fields Association , which was formed after a meeting called by the British Legion. The money was spent on levelling the site adjacent to the Legion Hall. After this operation little use was made of the area until 1965 when the Association requested a further grant to purchase children’s equipment; this was duly sanctioned at a parish meeting and £400 was used to provide the various pieces of equipment. In 1967 the Association was again in jeopardy and the Council formed a new committee with the Legion, to continue to run the play area. In 1971 the lease renewal became due, but the Legion required the area on which to build a new hall, thus it became necessary for the Council to consider a more permanent solution. A temporary agreement was reached that the equipment could stay on the Legion site until it was required by the builders of the hall. At a parish meeting in 1970 the Council was authorised to investigate sites and open negotiations for the purchase of the land. One year later a meeting supported the choice of the site behind the Bull Inn. Since then, the parish council, through the Berkshire County Council, have been engaged in a local enquiry. The owners and the tenant farmer withdrew objections in early 1973 and negotiations for valuations etc. are under way. On 24th September, the Parish Council took over 10 acres of land and it is hoped it will be opened in part in early 1974. Several village organisations have already given donations for trees for ‘Plant a Tree Year 1973’ . These donations will be used to purchase trees for the recreation ground. This will be an area for everyone, to give pleasure to young and old alike for the villagers of Arborfield in perpetuity. 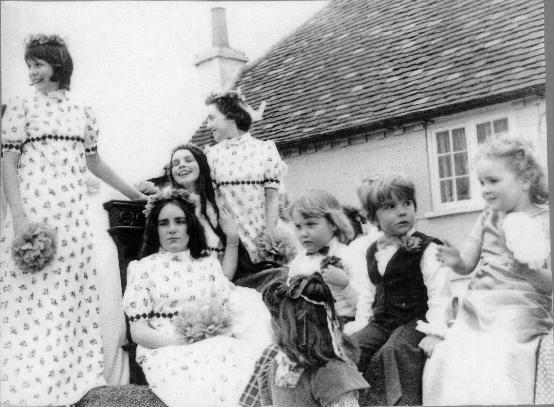 Ann Dicker of Link Way was crowned Flower Queen, and opened the new Recreation Ground. 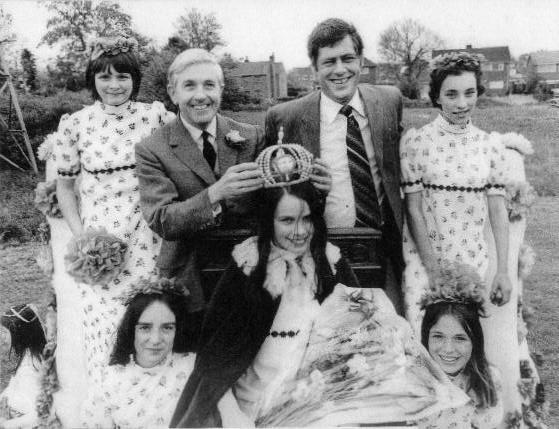 From the Parish Council, Fred Fox chaired the judging committee, and Alan Canham is shown placing the crown on Ann. Standing next to him is Noel Sudbury, then chairman of the Parish Council. Behind are houses on the Swallowfield Road; the one on the left has since been demolished. The Pavilion had not been built. This photo shows the float on its way past the 'Bull' as the procession moves along Swallowfield Road.